Homes all over Central Florida have added a screen enclosure to either cover a pool or to simply add more space to a screened in outdoor space. We have been able to do quite a few things with our products to enhance to look and usability of existing or new screen enclosures. Got nosy neighbors? No problem, let us install some motorized or manual privacy shades on the sides of your enclosure and say goodbye to prying eyes. Want to expand your outdoor living area? We can help you modify your existing screen enclosure and put in a motorized retractable screen that creates a movable wall to open up to your new outdoor deck. Early morning or late afternoon sun blinding everyone in the pool? 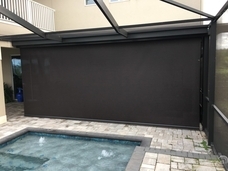 Let us install some motorized or manual shades directly on your screen enclosure and everyone can enjoy being outside or in the pool without the fury of our Central Florida sunshine.